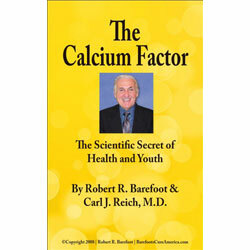 The Calcium Factor is written by Robert Barefoot and Dr. Carl J. Reich, MD. Together Barefoot and Dr. Reich review the importance of consuming a sustainable amount of calcium as an essential part of a healthy diet. Calcium acts as a natural building block to the body's immune system. When taken on a regular basis, the body has the ability to fight off immune issues such as cancer, diabetes and heart disease. The Calcium Factor is an essential guide to aide the reader in developing a better sense of well being, lifestyle and health simply by including daily doses of calcium. The Calcium Factor is the ultimate "how to" guide on incorporating calcium into a balanced lifestyle.